Synthetic peptide within Human MBOAT4 aa 257-287 (internal sequence) conjugated to keyhole limpet haemocyanin. The exact sequence is proprietary. Our Abpromise guarantee covers the use of ab170690 in the following tested applications. 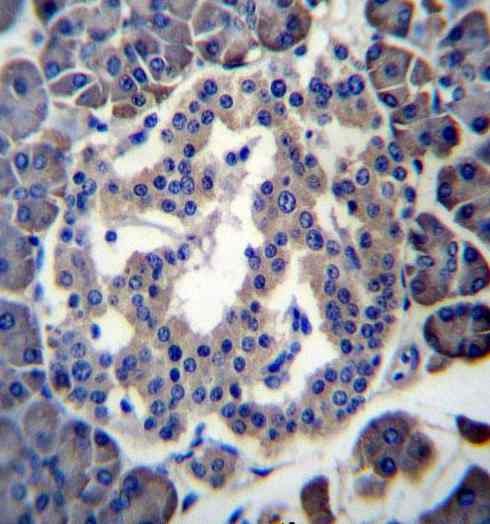 Expressed predominantly in stomach with moderate levels in pancreas and relatively low levels in most other tissues. Immunohistochemical analysis of paraffin embedded Human pancreas tissue labeling MBOAT4 with ab170690 at 1/10 followed by peroxidase conjugation of the secondary antibody and DAB staining. 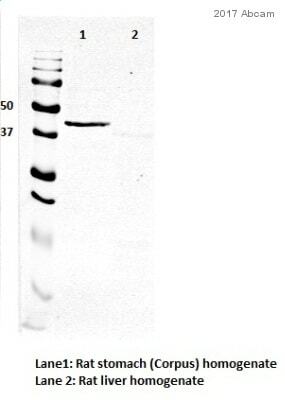 Lysates/proteins at 12.5 µg per lane. Publishing research using ab170690? Please let us know so that we can cite the reference in this datasheet.